CENTURY 21 Main Street Realty is made up of diverse cultures and provides service in many languages: Chinese (Mandarin), Greek, Hindi, Italian, Panjabi (Eastern), Spanish, Tagalog, Urdu. CENTURY 21 Main Street Realty embraces technology and utilizes all resources to ensure client’s needs are met with no compromise to the personal connection. To provide you with the best listing price for your home our agents research and prepare a professional opinion of the value of your home. We then work to bridge the gap between the buyer and seller by educating both parties. CENTURY 21 Main Street Realty provides the expertise and negotiation skills needed for buying and selling success. CENTURY 21 Main Street Realty assists with Corporate Referrals. We are very knowledgeable and have had great success in providing specialized services to transferees. From the time you first visit the area to when you close on your house we are here to make the transfer easier for you and your family. 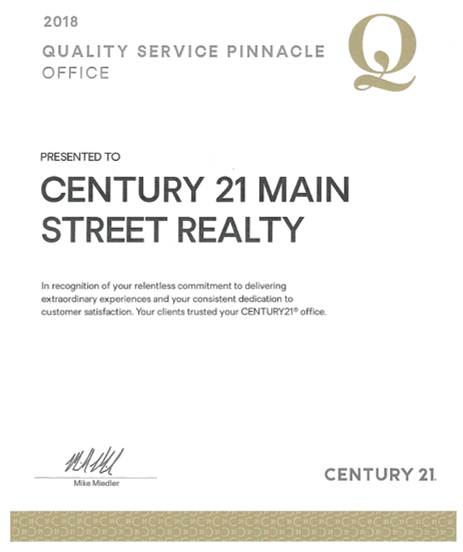 CENTURY 21 Main Street Realty has been honored with the coveted Quality Service Pinnacle Office Award for 2018. This is an award based on the results of customer surveys. In order qualify an office must have a 90% or better overall score based on performance, satisfaction, and recommendation . . . two years in a row! We are very proud of this award as it confirms our commitment to the total satisfaction of our customers. After all, that's the most important thing we do! CENTURY 21 Main Street Realty is able to help buyers and sellers throughout the State of New Jersey, but calls Middlesex County home. Broker Barbara Sancilardi was born and raised in Woodbridge Township. She lived in Fords until 19 then moved to Colonia. Woodbridge in Middlesex County is one of the most convenient places to live in Central Jersey. It's called the crossroads because every main thoroughfare comes through Woodbridge -- 287, Route 1 & 9, Turnpike, and Parkway. You can be in Manhattan in 40 minutes, and at the Jersey Shore in 40 minutes. New Jersey Transit trains and buses make it convenient for those commuting to the city for work. Contact Us for exceptional and personable service!